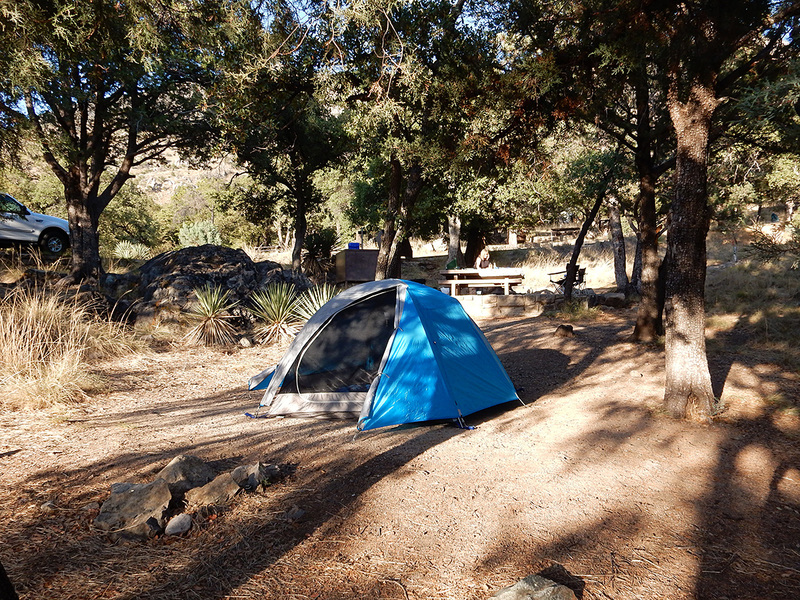 Madera Canyon, located in the Coronado National Forest on the west side of the Santa Rita Mountains, is about 46 miles from our house on the eastside of Tucson. 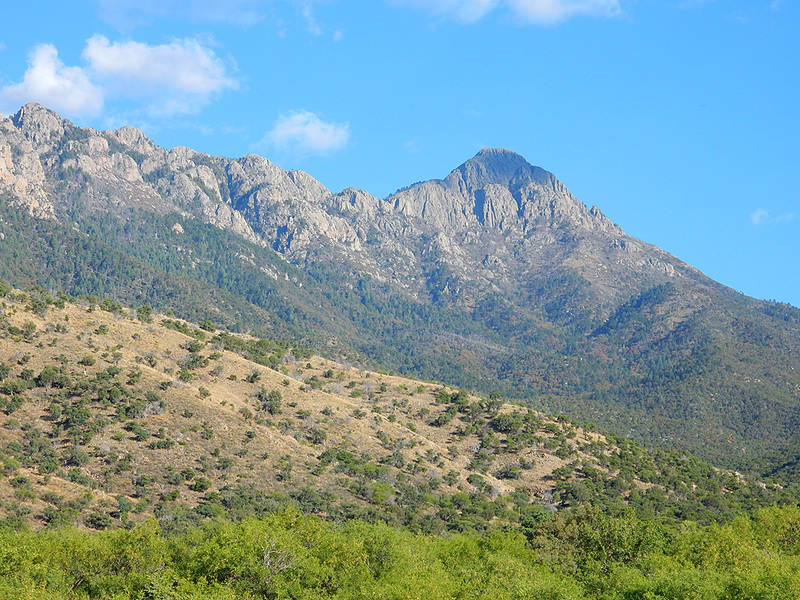 The elevation of the canyon floor is at 3,562 feet, with the peaks of Mount Wrightson (9,452 feet) and Mount Hopkins (8,586 feet) looming overhead. 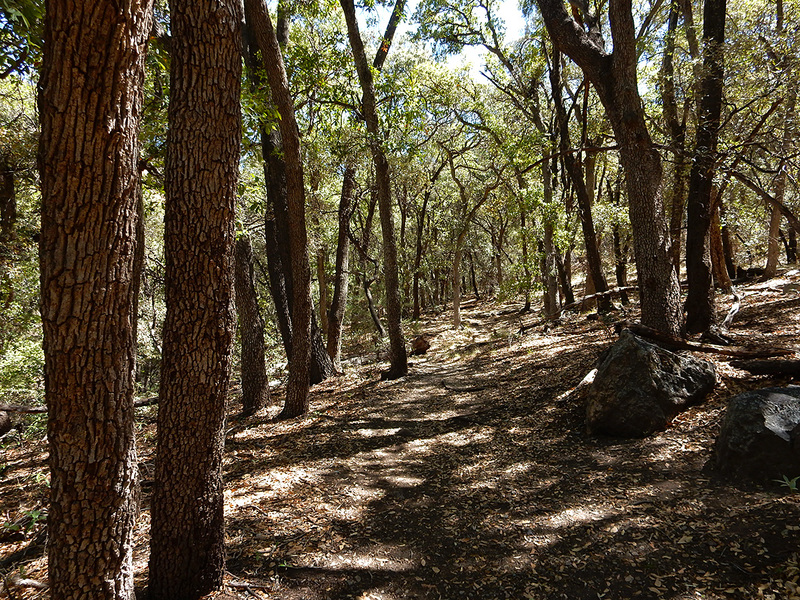 The area around the Bog Springs Campground is a mix of grasses, cacti, oaks, mesquite, juniper, and piñon pine. Over 250 species of birds can be found here, making the canyon of the premier birding spots in the world. Eloise and I just visited Madera Canyon for the first time a few weeks ago. Already itching to do some camping, our tour of the Bog Springs Campground sealed the deal and within a few days I announced that we would camp for a night during the Memorial Day weekend. 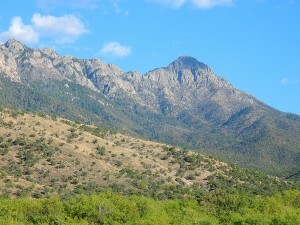 Mount Wrightson looms over Madera Canyon. Photo from day trip earlier in May. Though we were only camping for one night, much preparation was needed. We hadn’t camped in over 10 years. 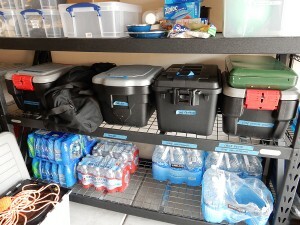 Our gear was packed away in a number of boxes and crates, spread out between our garage and two storage units. It needed to inspected, tested, and organized. Since we had also started to think about family disaster planning, it only made sense to organize our gear so that most stuff served a dual purpose – recreation and survival. (At some point, I’ll cover some of my planning and organizing in another post.) Over the last couple of weeks, a number of runs were made to likes of Sports Authority, Big 5 Sporting Goods, Ace Hardware, and local favorites Summit Hut and Miller’s Surplus. Yes, gear lust took hold, but I managed to control myself. My OCD tendencies also manifested themselves, as a various number of containers (Plano Sportsman’s Trunks and Plano Field Boxes, and British-made Really Useful Boxes) were procured, filled, labeled, and sometimes stowed in one another. Batteries were marked with the date of purchase. New flashlights, lanterns, and other goodies were compared, bought, and assigned to the appropriate crate, box, bag, or fanny pack. Gear organized by type & on the shelf ready to go. On top of the gear and food preparations, arrangements needed to made for someone to cover the business for the 36 hours or so while we were gone. Even though one day was a holiday, I already had a full day of transportation jobs on the schedule, plus someone had to take whatever calls would come in, schedule them, and if need be, assign drivers to cover them while I was gone. I was determined not to be tied to the phone, and there is almost no cell phone signal in the canyon anyway. Be what may, the guys needed to come through for me, and happily I can say, they did. Since we were going into the canyon at the tail end of the holiday, I figured that most of the weekend campers would be departing the campground around noon or 1, and that if we got to the campground around 3, we would be able to find a spot before and if the facility filled up for the night. I had taken the Expedition into Goodyear for a last minute concern, and had the oil changed while I was there – so we didn’t start loading the truck until about 1:30 pm. Even so, having packed our clothes bags the night before, gathering the food from the fridge at the last minute, and putting the fully organized gear into the Ford, allowed us to hit the road an hour later at 2:30 pm. 46 miles and an hour later, we arrived at the canyon. This was our first time camping here. A few campsites were available. The campground road is a single loop, which climbs as you go to the rear of the loop, and descends as you exit the campground. Campsites are spread out on the inside as well as the outside of the loop. 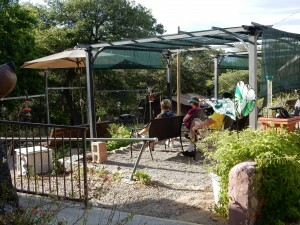 We inspected the open spots, looking for privacy, shade, position of the picnic table and tent pad, and nearby neighbors. The single toilet facility is near the top of the loop. We picked a spot at the at the lower elevation, farthermost away from the bathroom. We had not really considered this until we had made camp and were done with dinner. So we improvised. I’ll leave it at that. Since Eloise sleeps until noon or so, I thought I would get a short hike in after breakfast. In the campground is the trailhead for the “Dutch John Spring Trail.” The little Forest Service pamphlet describes this hike as a “moderately easy” trail. They lied. The trail has an 800 feet elevation gain in a mile, essentially straight up from the get go. This was my first real uphill hike in a couple of months, and I was not prepared for the pain that ensued. Plus, the trail was between 4,000 and 6,000 feet elevation, an altitude that I’m not used to. I’ve got a lot of work to do to get back into shape. 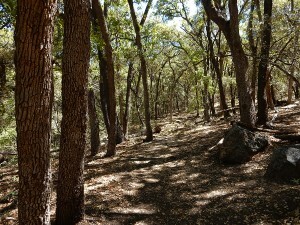 Otherwise, it was a pretty hike up through the oaks, and I only came across 5 other hikers in the time I was out. I had to cut the hike short to get back to the camp by the time I had specified on the note I had left for my sleeping wife. I did not want Eloise to awaken and sending out the rangers looking for me because I hadn’t returned on time. The observation deck at the Santa Rita Lodge. Photo from previous day trip. After she awoke, we ate a midday meal and broke camp. This went pretty quickly. 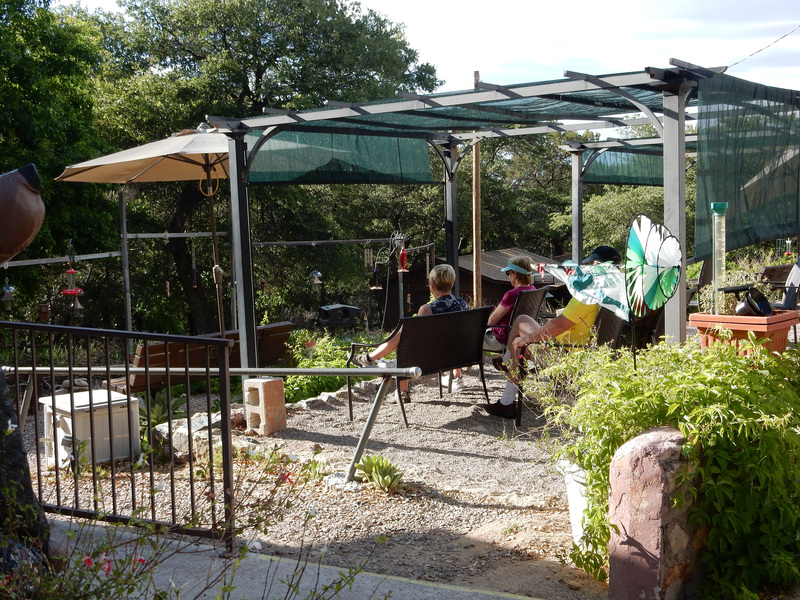 We left the campsite around 2:30, and went over to the Santa Rita Lodge, where they have an observation deck, complete with seating and shade, where one can watch birds come to the feeders set up off the deck. Eloise and I are pretty new to birding, so we couldn’t identify everything, but it was enjoyable to watch the various hummingbirds, sparrows, finches, doves, and wild turkeys flit about. The term “pecking order” takes on a whole new meaning when watching so many species interact in a small space. 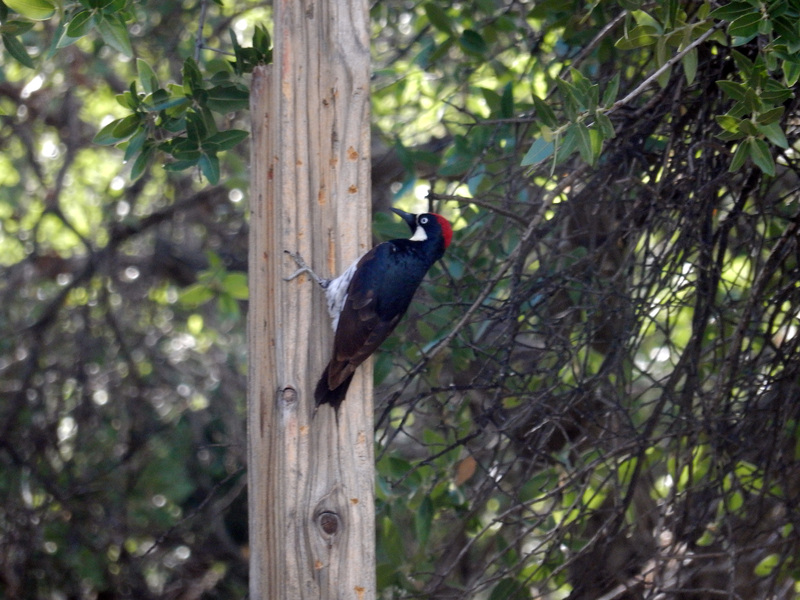 Off to one side we observed several Acorn woodpeckers tussle over a hole on an electrical pole. Mexican jays and doves did their best to muscle smaller birds off some of the feeders. One species would occupy a feeder for few moments, then leave, to be replaced by a whole new species. After a time, this would be repeated. Fun to watch. 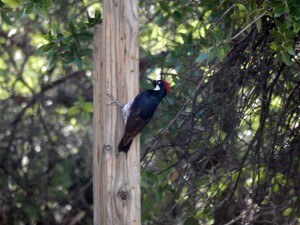 Acorn woodpecker at the Santa Rita Lodge feeders. Photo from previous day trip. Finally it was time to head home. All in all, a short, but great trip. 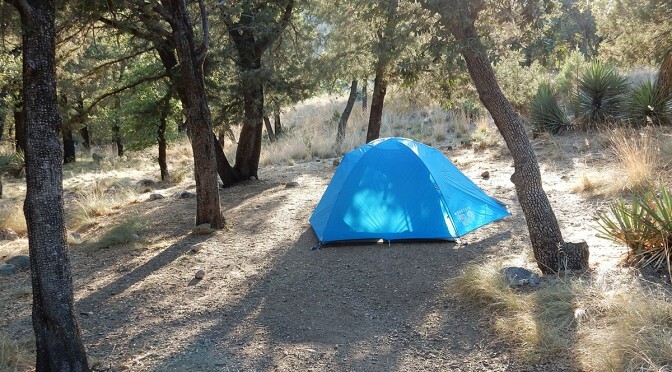 I was happy with my gear organization, the new Mountain Hardware Optic 3.5 Tent was a joy (see short review below), the weather was great, and I didn’t get Eloise mad at me. The route between our house and the canyon is an easy drive, so I can see us popping down here from time to time for a night or two – if we keep our gear organized, we could go down on pretty short notice. Mountain Hardware Optic 3.5 Backpacking Tent. Described as a 3+ person tent. It was spacious and quite airy, given its four-sided mesh screen construction. There are doors on adjoining sides that roll back to offer huge views and easy access; the rainfly covers these adjoining doors (see photo set) to offer easy access and ventilation. It was easy to put up and take down. The only negative is that the seam on the rainfly tore at the only tie-down point that was not reinforced as well as every other tie-down point on either the rainfly or tent. Odd, to say the least. TOTAL TRIP MILEAGE: 102.0 miles. Infrastructure, A Guide to the Industrial Landscape (Revised & Updated), by Brian Hayes, 2014 - an overview of the industrial environment, like mines, power plants, mills & refineries, the electrical grid, and more. The Last Ranch - A Novel of the New American West, by Michael McGarrity, 2016 - the third in a series of fictional historical novels, tracing the roots of McGarrity's modern fictional New Mexico law officer Kevin Kerney. Throughout the series, McGarrity creates a spectacular sense of place and time as Kerney family members work their way across the American West, finally settling in New Mexico's Tularosa Basin.